This is the blog of the engineering freshman seminar course titled “Bio-Aerial Locomotion”, taught by Prof. Lorena Barba at Boston University. This course is one of several options of the Introduction to Engineering series (EK 131/132) at the College of Engineering. The course aims to motivate the subject of bio-inspired engineering, characterized by seeking examples in the biological world of the desired function in the engineered creation. In particular, we seek examples of aerial locomotion in the increasingly sophisticated forms of: falling, parachuting, gliding and flying. “Aerial locomotion” is the term most often used to refer to the self-generated movements of any animal through the air. I’ve added the prefix “bio-” simply to be more explicit that we are focusing on the solutions that Nature has found to maneuver in the air medium. Human-designed flying devices are barely over 100 years old, which is short in historical terms, but minuscule in evolutionary terms. 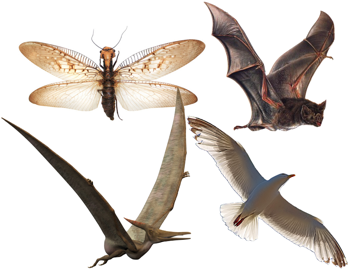 In Nature, flight has evolved very efficiently (much more efficiently than in engineered flight) at least four times: in insects, pterosaurs, birds and bats. But in addition to powered flight, many biological organisms have evolved forms of passive flight and ways to maneuver in the air. When falling, geckos are able to right themselves turning their body in mid-air, and always land safely on their feet. Some species of snakes can glide to the ground while slithering their body to adjust their shape; and samaras (winged seeds like the maple seed) slow their descent as they spin, so the wind will take them farther aiding dispersal of the tree species. In this course, we will discuss a selection of interesting cases in Nature of: falling, parachuting, gliding, flying & soaring. Parachuting and gliding can be thought of as flying without any power; the only difference between the two is the angle of the flight path. By “parachuting”, we mean falling with the aid of an aerodynamic braking effect, reducing the rate of descent. To be precise in the distinction with “gliding”, parachuting is defined as having a trajectory of more than 45° from the horizontal. Flying squirrels, for example, really glide: they can achieve trajectories at an angle of about 27º from the horizontal (a 2:1 glide ratio). The various examples from Nature on staying aloft and maneuvering through the air are inspiring engineers today to design new devices, such as micro-air vehicles and robots. In this course, we’ll glimpse at the modern activity of bio-inspired engineering in fields like aeronautics and robotics. ¹ “The nature of flight. The molecules and mechanics of flight in animals”, Philip Hunter, EMBO reports (2007), Vol. 8: 811–813. ² “The aerodynamics of Argentavis, the world’s largest flying bird from the Miocene of Argentina”, S Chatterjee, RJ templin, KE Campbell Jr., PNAS (2005), Vol. 104: 12398–12403.